As Breast Cancer Industry Month comes to a close, it’s time to harness our collective power. We know that when we raise our voices together, we amplify our message and make multimillion dollar corporations stop the pinksploitation of breast cancer and change their pinkwashing ways. Join us for 25 hours of action, on the 25th anniversary of the pink ribbon, to challenge the breast cancer industry. Estée Lauder wants to celebrate the 25th anniversary of the pink ribbon. Join us in sending them the kind of gift that leaves a lasting impression: thousands of emails in 25 hours. Help us kick off 25 hours of action on Monday, October 30th, to tell Estée Lauder why their ribbon is “Knot Our Pink Ribbon” and why they need to stop the betrayal. Send your email to the CEO and the Executive Chairman of Estée Lauder. If you only do one thing today, make it this. Taking action is easy. Follow this link. Then enter your name, email, and zip code. Click “Send Email” and you’re done. Share that you took action on Facebook and Twitter. After you take action, use our pre-populated posts or edit them to make your own. Share our action on Facebook and Twitter and encourage others to take action. 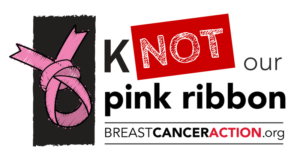 Tag us at @BCAction and use our hashtag #KnotOurPinkRibbon. Tweet at Estée Lauder using their hashtag #pinkribbon25. Tell them why it’s time they change their pinkwashing practices and stop peddling empty awareness. Help us flood Estée Lauder’s inbox, and social media threads, with messages that tell the truth about breast cancer and why this global cosmetics corporation needs to do better to truly support women at risk of and living with the disease. The momentum is with us. Now is the time to turn your outrage into action. ← Our Campaign Has Momentum, But We Still Need YOU!